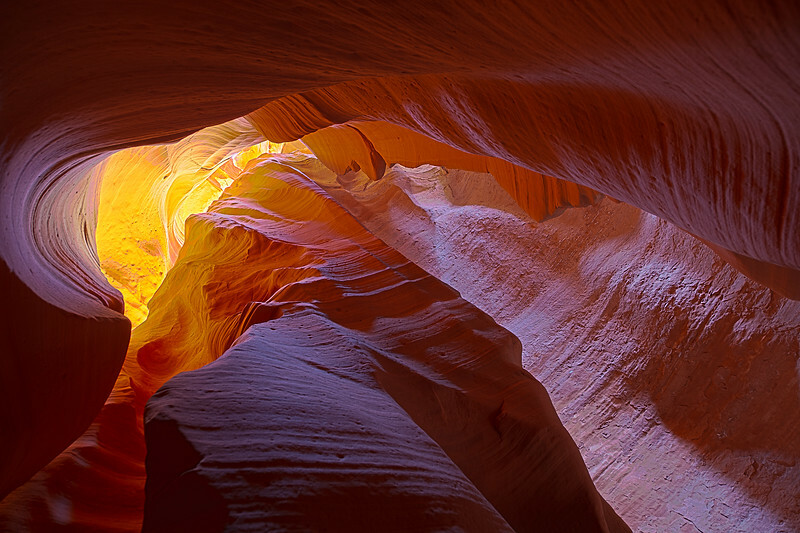 CanyonX is located outside of Page, AZ, close to the better known Antelope Canyon. CanyonX is not well known as it is somewhat difficult to get to as you have to walk down (into) and up (out of) the canyon. Go to this site http://www.overlandcanyontours.com/xcardiac for a short movie of the climb in and out. (Scroll down to bottom of page to find the movie). The last picture was taken (after Sunset) at Horseshoe Bend, AZ, where to Colorado River makes an almost 360 degree turn. Note the edge of the cliff at the bottom of the picture to see how close I was. In order to capture the River at the U point, it is necessary to hang out over the edge (1,000 ft drop) with camera on a tripod. Many have done it. Not me! Also, be sure to "Map It", upper right corner, to see the Google Earth view of exact location of my camera.